Calm and soothing water fountain in the garden. It was my first time to visit a garden like this on a backyard setting, quite small backyard yet its wonderful transformation to such tropical breeze is indeed a work of a passionate garden lover. We visited this garden last Saturday, 15th of March 2014. Well, as I read the garden notes I took and referenced it to her website; I came to know that the owner is a qualified Horticulturist very passionate about plants and gardens, and a member of the ABC Gardening Australia. 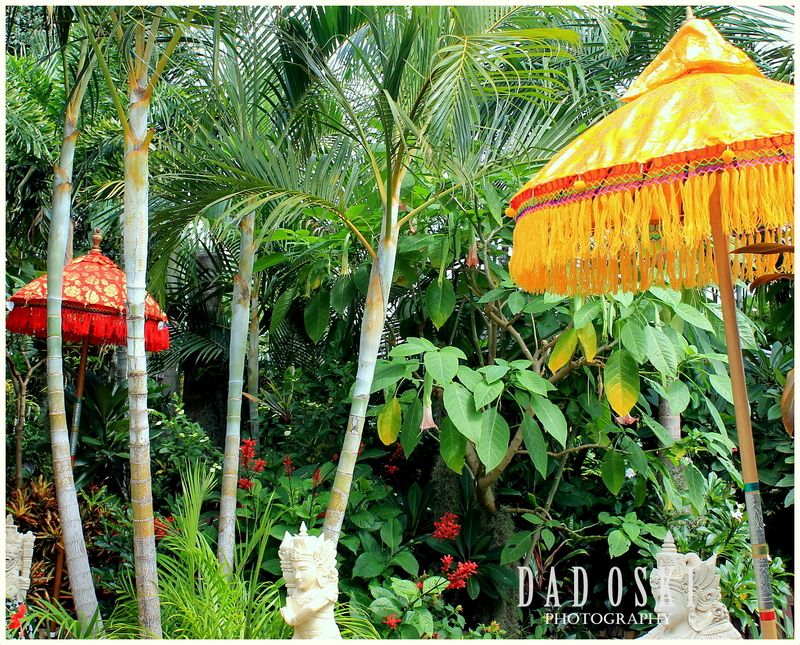 The garden is a Balinese influenced garden. These colourful umbrellas added more senses to the garden. At the entrance to the Lower section of the back garden, temple warrior statues stand guard; Brahma the creator is on the left side, while Wisnu the protector is on the right side. Also, two big umbrellas, one in bright red, the other is a bright yellow, both form part of the attractiveness and beauty of the garden. 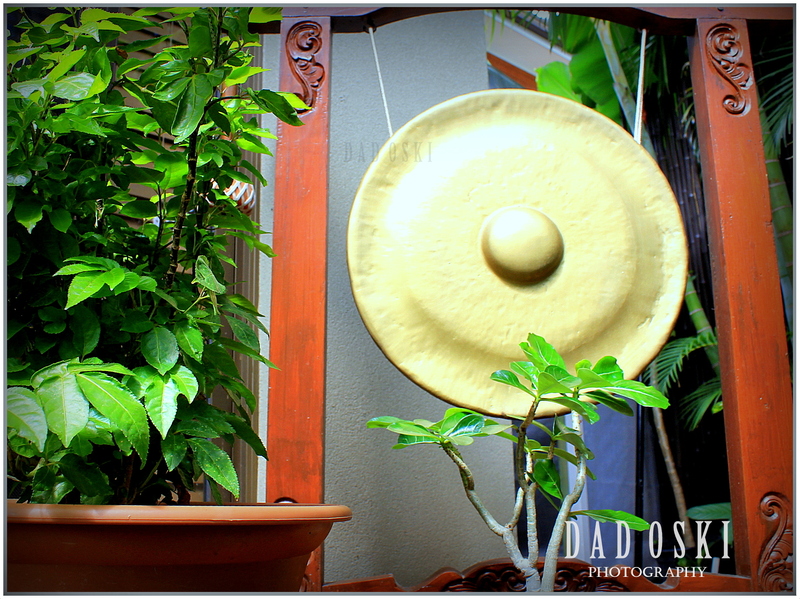 There is also a wind chime hanging right above the rear door of the house, and a large gong at the pavilion. Then, two Balinese temple guards with scary faces stand guard at the stairs leading up to the Pavilion area. 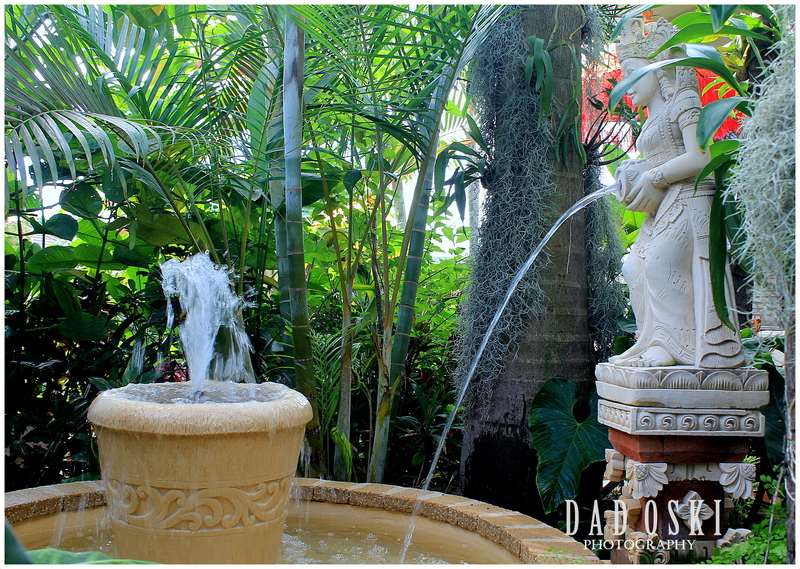 Here, Balinese birdbaths and a pond add to the soothing sound of moving water while Saraswati (Hindu goddess of knowledge, music, arts and science) sits on top of her plinth surrounded by a variety of tropical shrubs. Another attraction is the Pool Garden. 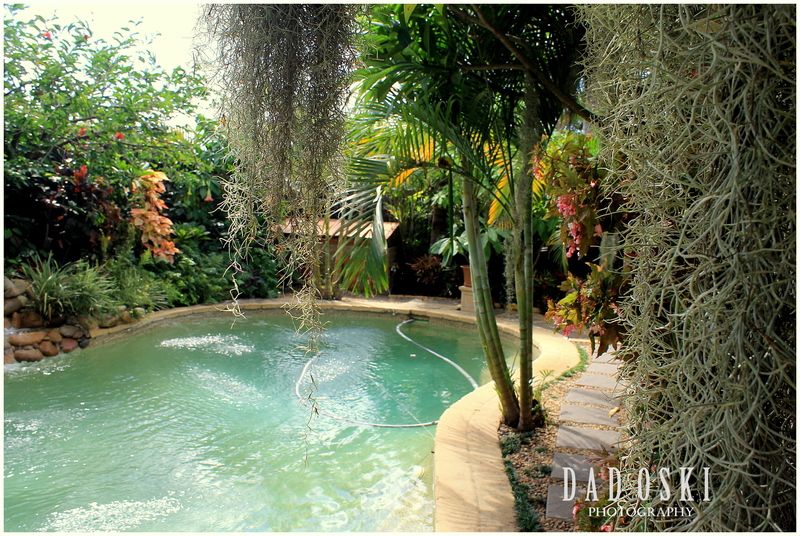 I like the way she managed the plants atop and along the way as well as besides the pool area. Small shrubs grow and thrive under the canopies of bigger palm trees like Bangalow palms, Golden cane palms, Brugmansias and younger frangipanis. Another oriental attraction in the garden. 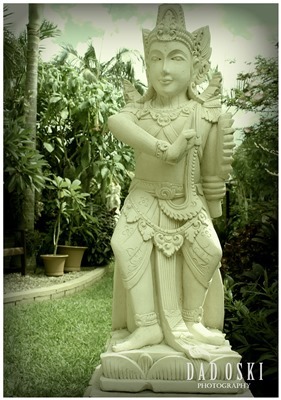 One of the many Hindu (Balinese) statues inside the garden.